Jordie Bellaire (A) Dan Mora (CA) Kevin Wada • Go back to the beginning as the critically acclaimed pop culture phenomenon Buffy The Vampire Slayer is reimagined under the guidance of series creator Joss Whedon. 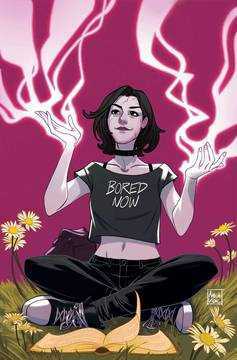 • This is the Buffy Summers you know, who wants what every average teenager wants: friends at her new school, decent grades, and to escape her imposed destiny as the next in a long line of vampire slayers tasked with defeating the forces of evil. • But her world looks a lot more like the one outside your window, as Eisner Award-Nominated writer Jordie Bellaire (Redlands) and Russ Manning Award-Winner Dan Mora (Saban's Go Go Power Rangers) bring Buffy into a new era with new challenges, new friends...and a few enemies you might already recognize. But the more things change, the more they stay the same, as the Gang faces brand new Big Bads, and the threat lurking beneath the perfectly manicured exterior of Sunnydale High confirms what every teenager has always known: high school truly is hell. • WELCOME BACK TO THE HELLMOUTH, FOR THE FIRST TIME!.